Oh my goodness! Halloween is tomorrow! 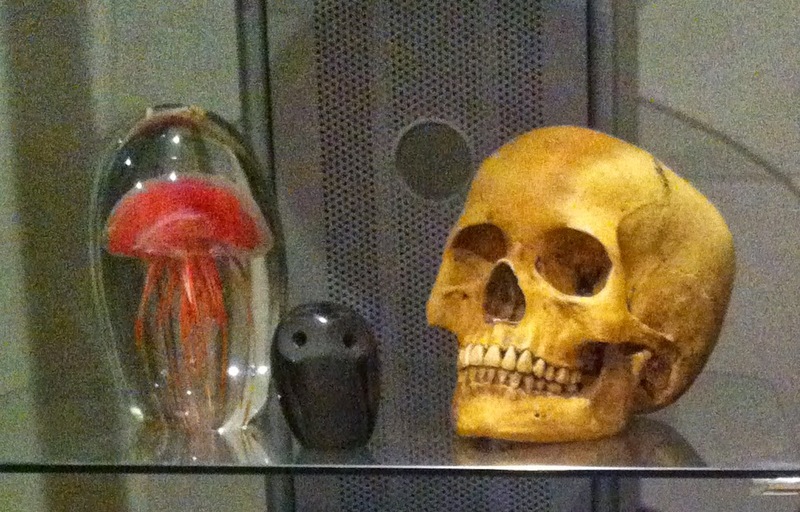 We have a cast of a skull in the living room. We have busts of the Bride of Frankenstein and Werewolf, and mini Madame Alexander dolls of the Wicked Witch of the West and Glinda the Good Witch on a bookcase in our computer room. 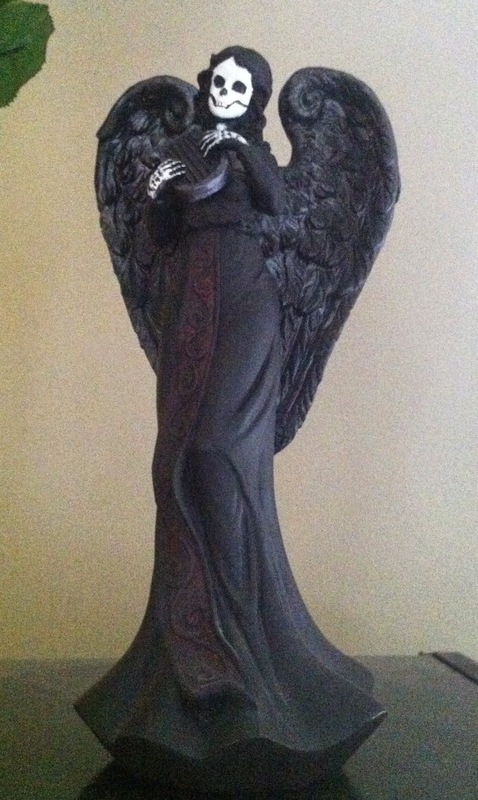 On another bookcase in the computer room, we have a (tarnished) antique silver candelabra and matching vase with black roses, and an Angel of Death figurine. My sister painted this figurine and gave it to us for Christmas one year. 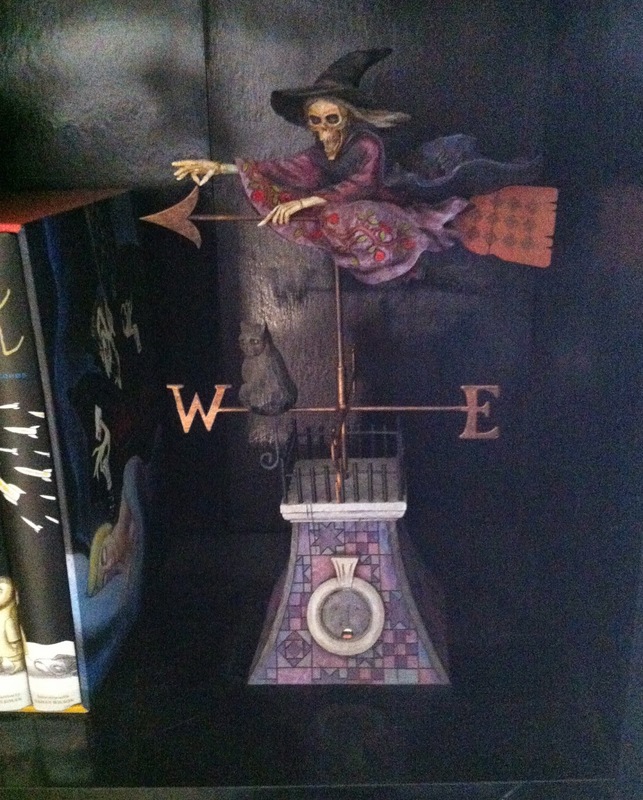 On that same bookcase, we have a witch and cat figurine/windvane that my husband's sister gave us. 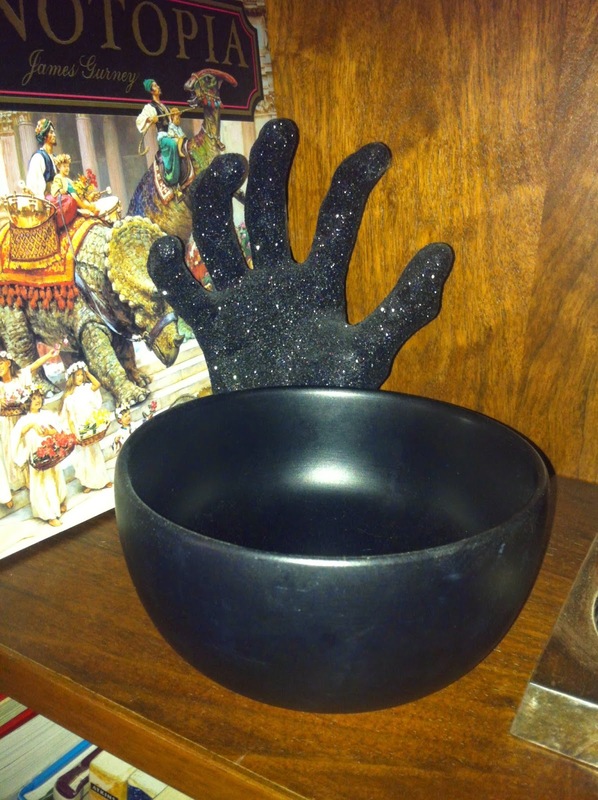 On a bookcase in the living room, we have a glittery severed hand that sits behind a black wooden bowl. 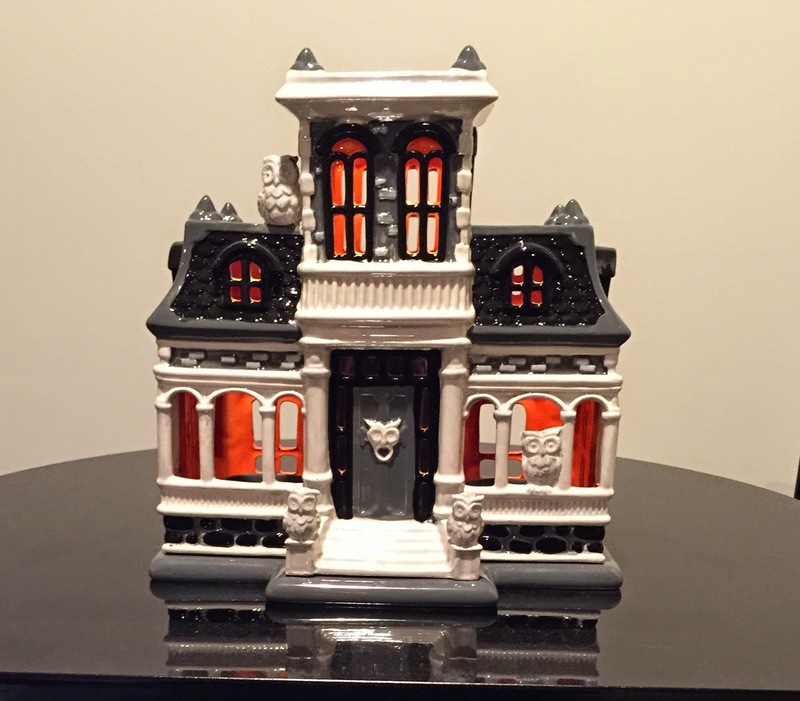 My mom just gave me this awesome Second Empire-style ceramic house that is kind of haunted house-y. This is how my husband and I want our house to look. It would require a total rebuild, though. She also gave me this nightlight/fragrance diffuser with a "bulb" (they call it a bulb) of Cinnamon Pumpkin Spice fragrance. In the guest bedroom, we have a set of glow-in-the-dark zombie figurines that were a wedding gift from our best man and his wife. They know us so well. And then we have my husband's art. (I'm only going to show you three pieces, otherwise this would be a never ending post). This one is a self-portrait. 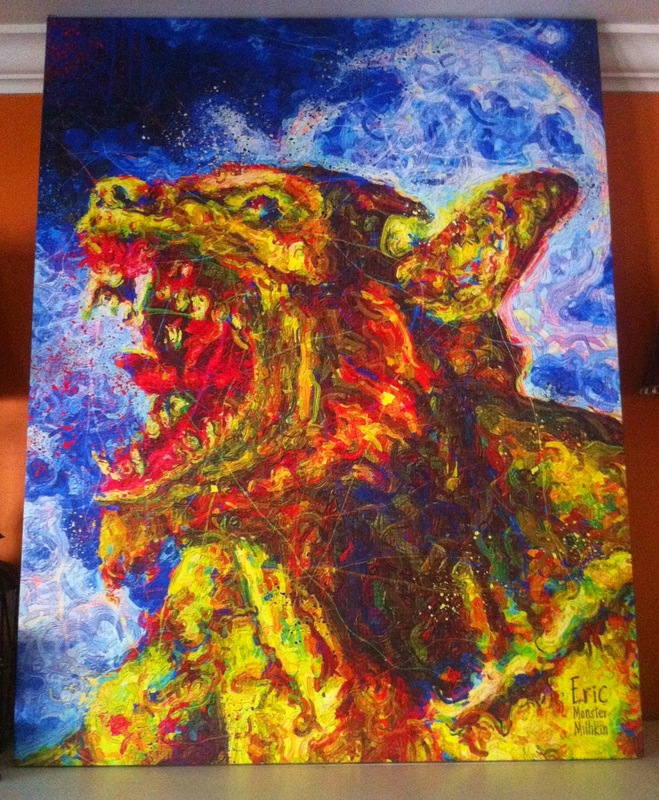 This one, called "My Dad is a Werewolf", is 4 feet by 3 feet large. Here is how it looks on the mantle. 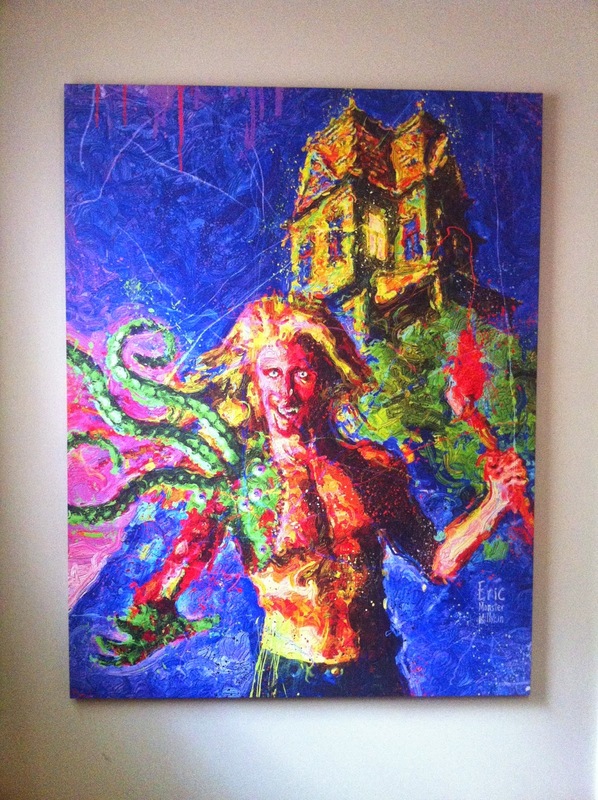 He created series of artworks called "Totally Sweet" that is a group of portraits of well-known horror villains/monsters (mostly from films) made out of Halloween candy. 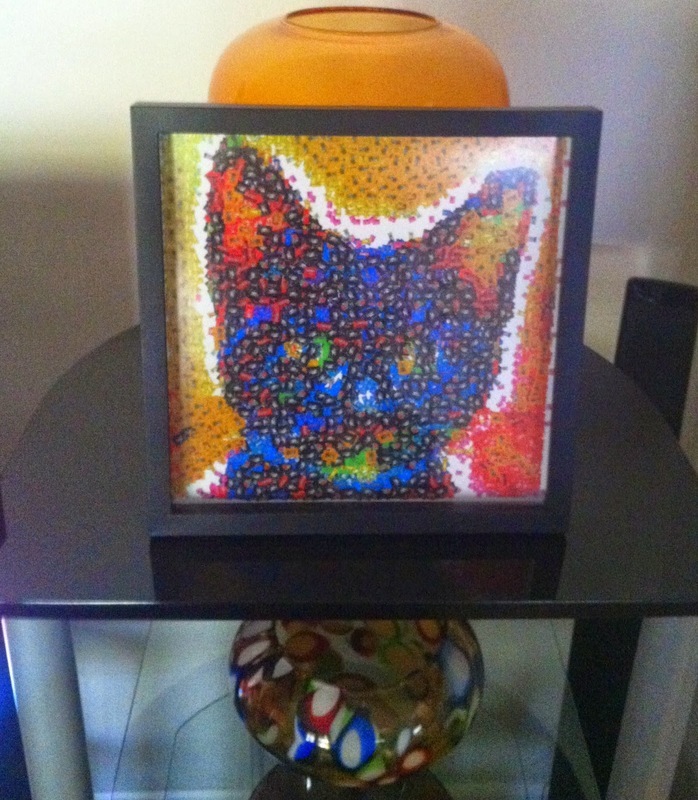 We have a framed print of the black cat portrait in the living room. 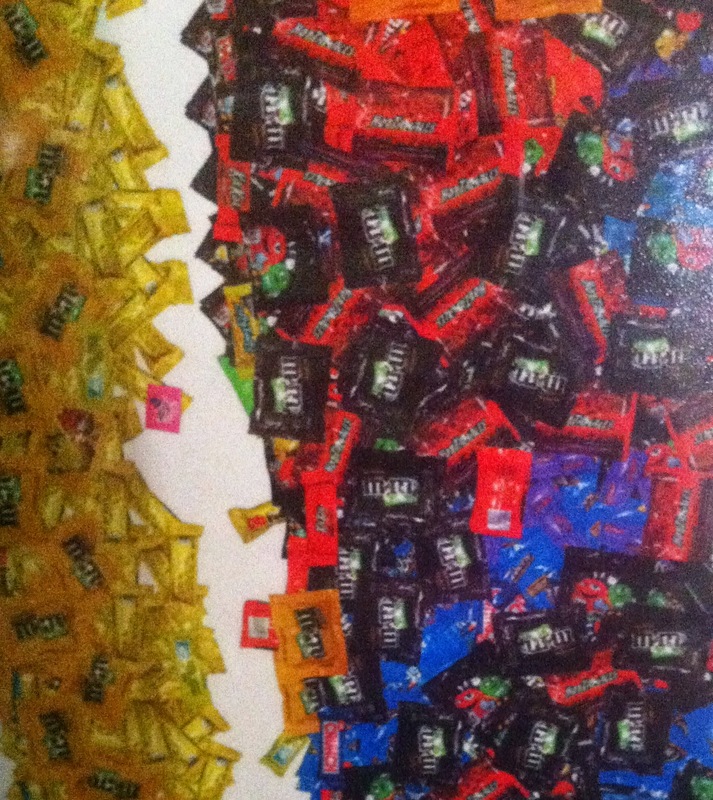 Close-up -- you can see all the different kinds of candy used. 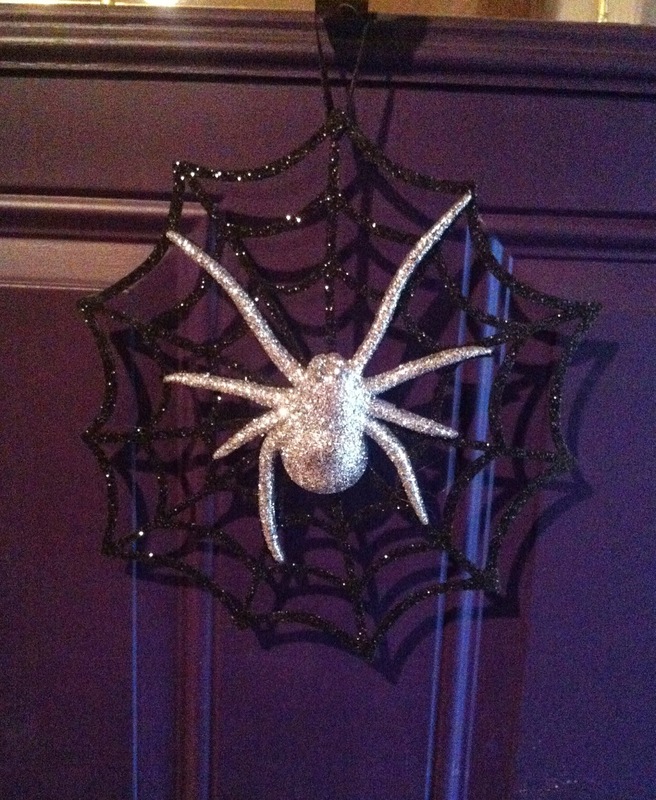 Glittery spider for the front door! I made this banner years ago. 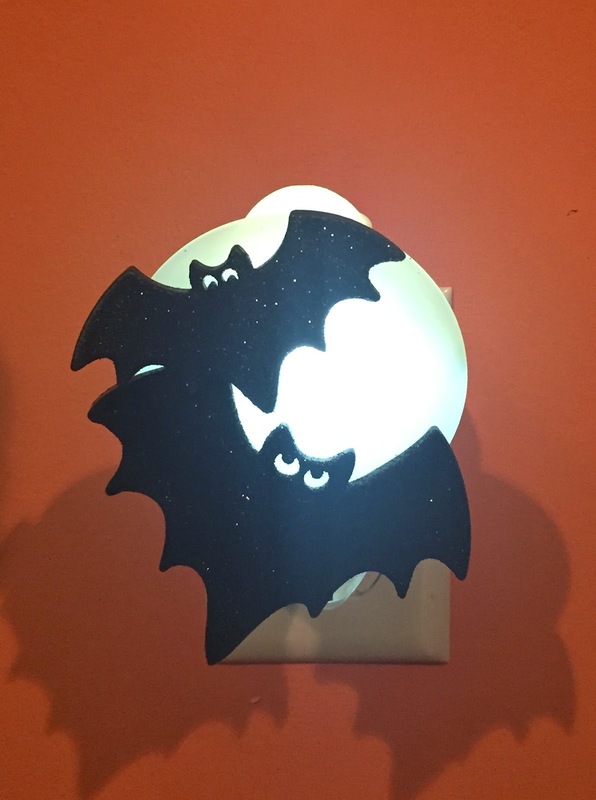 It is made out of felt bats and puffy paint. I love it! I even added dots of red glitter paint for the eyes. 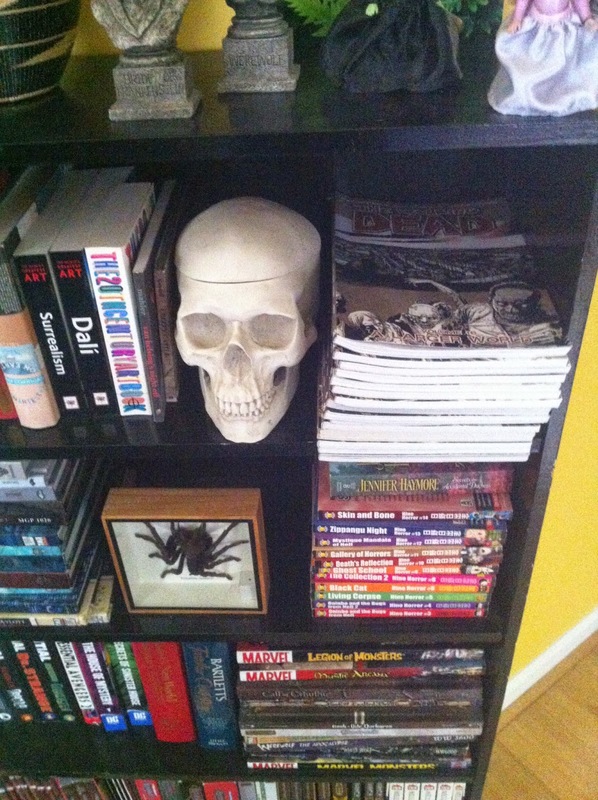 I hung up some skull lights on the mantle. 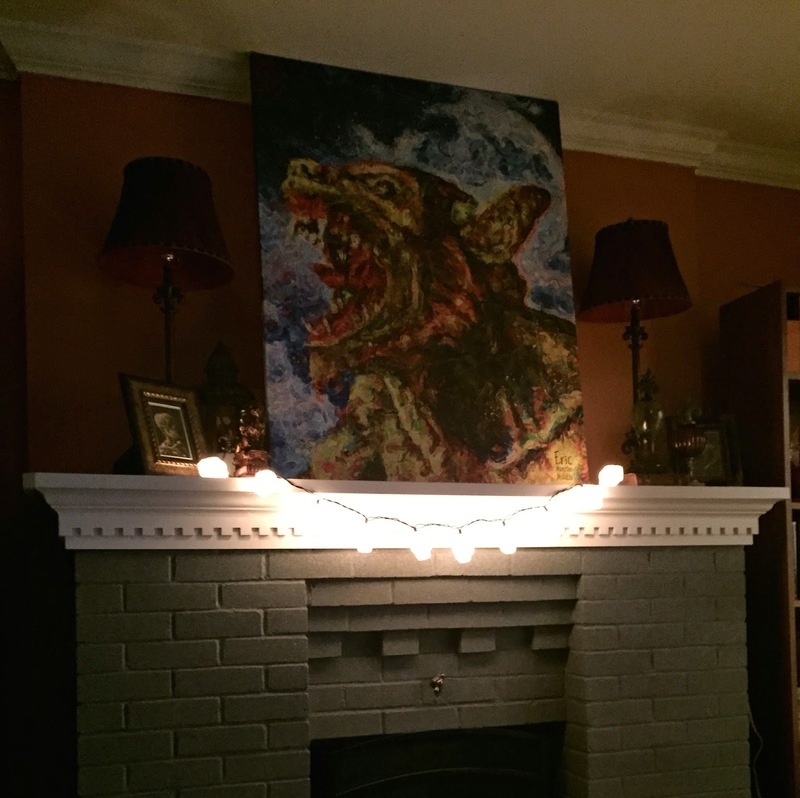 They look fitting under the werewolf painting. 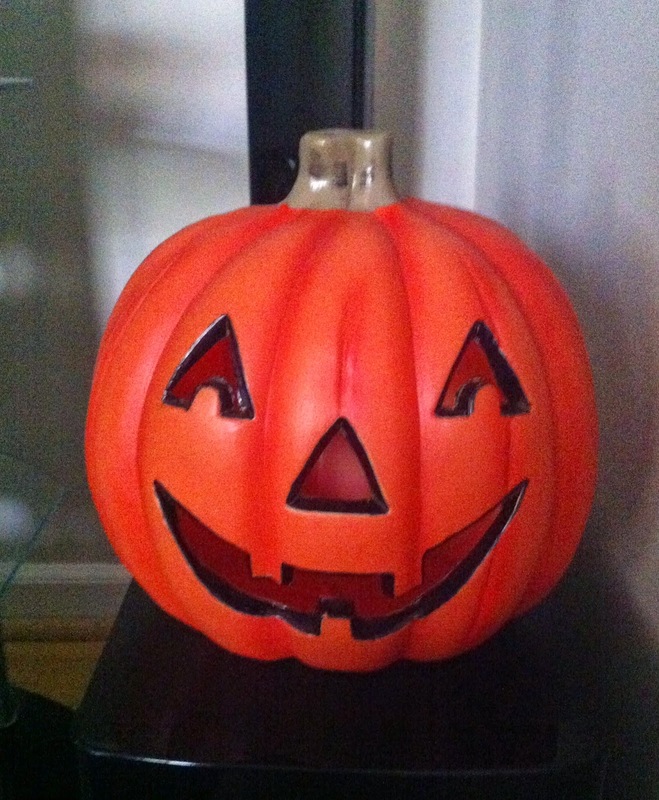 Of course, we will put out our plastic light-up Jack-o'-lantern on the porch on Halloween night. I did hang up this little dude, but maybe it's too morbid. P.S. If you would like to check out more of my husband's candy monsters from his "Totally Sweet" series, go to http://www.freep.com/story/news/weird/eric-millikin/2014/09/18/eric-millikin-totally-sweet-candy-monsters-2014/15804341/. He has 17 total so far, with more to come. They include Leatherface from "Texas Chainsaw Massacre", Vincent Price, Lily Munster, Audrey II from "Little Shop of Horrors", and a self-portrait. I guess you really don't need to decorate for Halloween! That is awesome you guys love all that stuff. My husband and I do too. We are big horror fans. Your husbands artwork is fantastic too! My goodness! You really love Halloween! ;) Super festive! Wow, those candy portraits are amazing! Especially Vincent Price. Maybe I just have a soft spot for him though. 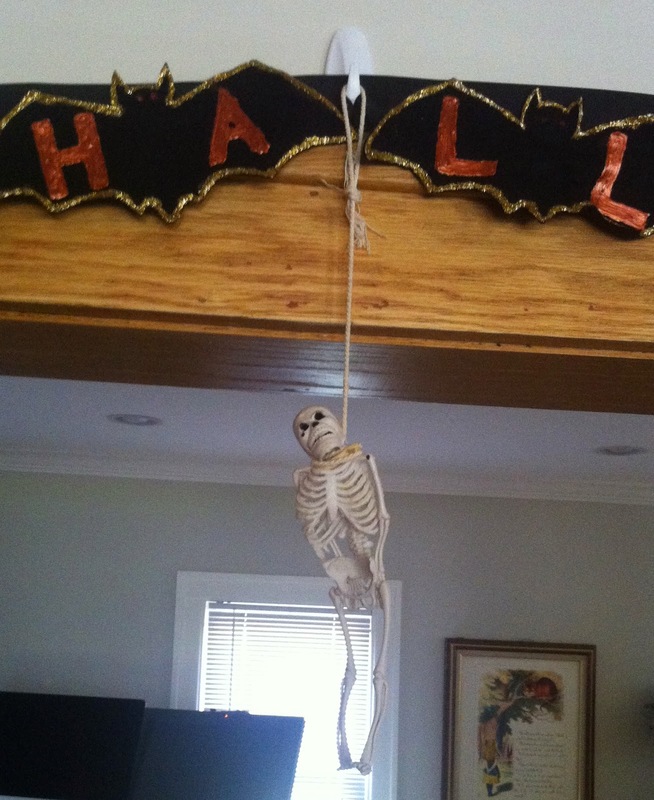 We don't really decorate for Halloween but I do have a little gargoyle of my own of some skeleton figurines that could probably be considered macabre? I think they're cute though! We're huge horror fans. I didn't used to be, but I think my husband influenced me somewhat. lol We are definitely ready for Halloween anytime! We love our spooky stuff for sure!! I am looking forward to decorating for the holidays, too! Holiday decorations make the house seem happier somehow. Vincent Price and Bride of Frankenstein (I think he published it on Halloween day) are my favorite candy "monsters" from the series. 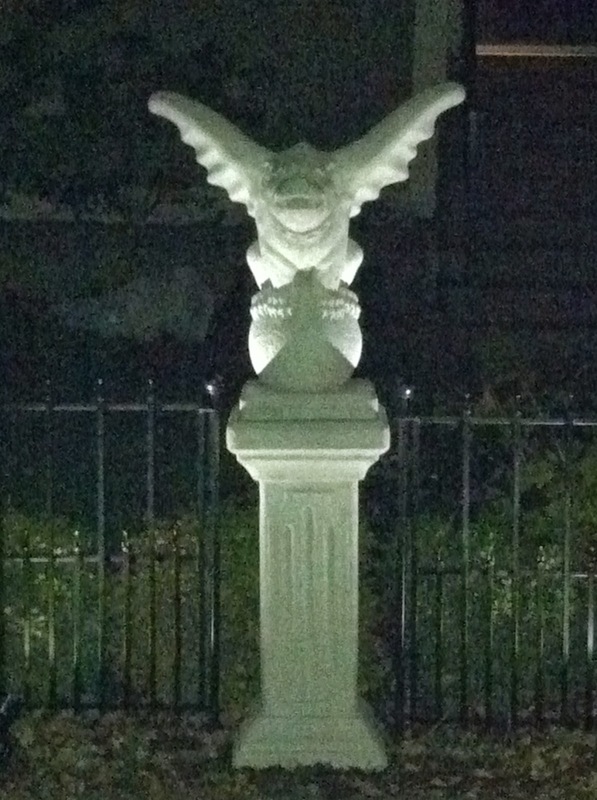 I just realized I forgot to post a pic of the gargoyle we have in the house (it's sitting on top of the antique clock in our living room, watching over everything).